The Palio di San Jacopo, Gallicano’s patron saint, always occurs on 25th July every year. This extraordinary event, where allegorical floats are preceded by fantastically costumed participants enacting complex choreographies, has been going since 1972 and, apart from a few instances when it was cancelled, has been growing from strength to strength. This year the Palio was exceptionally fabulous and anyone who missed it truly missed a great deal. Like other Italian palii there is a competition between various rioni to compete for the prize. Gallicano has three rioni today (there used to be four). They are Borgo Antico, Monticello and Bufali. Each year a new theme is given to the three rioni. This year it was ‘The Power of the Sun’. The prize of the palio is a special coloured cloth called ‘il cencio’. What is so incredible is the wonderful creativity and imagination a small town like Gallicano in the middle of a remote valley can muster for its Palio. Everyone has a chance to contribute with their skills, no matter what age. For a whole year before the actual palio (and especially during the long winters) ideas are thrashed out, designs produced, costumes made. There’s sewing, cutting, pasting with every conceivable material available. Floats are meticulously built up and mechanized in a special warehouse dedicated to the palio. It’s a sort of mountain version of Viareggio but with a greater emphasis on spectacle and with universal world themes rather than sometimes heavy political satire. The sheer love and resourcefulness put into the Gallicano palio is quite extraordinary and demonstrates fully the ability of Italians to get together, lay aside differences and produce something which I truly feel is of an international standard and equals some of the best shows of the world’s capital cities. After a procession of the floats through Gallicano’s narrow streets the event takes place in the natural arena below the church. The first rione to present its spectacle was IL Borgo Antico with a subtitle ‘Multiverso’. The third was Bufali with ‘the legend of Garfagnana’s birth’. After the wonderful spectacles presented by Gallicano’s three rioni, (frankly, I thought they should all have first prize!) we were treated to a splendid fireworks display. I ascended to the old church of San Jacopo in front of which the fireworks were to be set off. The launching pad was only a few metres away – I’d never been so close to seeing rockets actually taking off! It was quite awesome but also very noisy and a little terrifying! I thought that if this was great fun for us for others in less peaceful parts of the world it was, sadly, a spectacle they had to witness every day under the name of bombardments and death. The sun is life, however, and Gallicano and its inhabitants did themselves proud that evening with one of the very best of its Palii I’ve ever seen. It was an absolute treat for all those three thousand+plus lucky enough to have been there and was fully written up in the region’s papers giving Gallicano well-deserved publicity for a comune which not so long ago was dying on its feet but is now a model example of enterprise and strong future vision. The Italian word “Palio” can be applied to many different events. The most common use of the word is in the “Palio of Siena”, the famous horse race which takes place in the central fantailed and sloping square of this city between the various contrade or districts (all seventeen of them) at different times. Gallicano’s Palio, which is of more recent origin, dating from the early 1980’s, is essentially a competition of costumes, choreography and floats between the three rioni, Monticello, Bufali e Borgo storico, of this central Garfagnana town. The aim of the different rioni is to win the cencio or “rag”. The “rag” is a not very large piece of cloth designed with the colours belonging to all the “rioni” or districts. It’s a symbol of the town and embodies its creativity, enthusiasm and passion. It is also a symbol of a community who share a magic stage in which the creativity of this town (population less than four thousand!) produces a fantastic show that in my opinion has few equals anywhere in the world. All this is the result of hard work from each rione which starts almost as soon as the last Palio has ended. It involves every one of all ages and skills, from the design of the amazing costumes to the electronic wizardry of the floats to the planning of the themes. The Gallicano Palio, in short, involves everyone and everyone is involved in the Palio. I have been a couple of times before to this Palio and have always admired it. This year, however, the Gallicano Palio seemed to have taken a considerable step forwards, almost as if to affirm that those two recent years it didn’t take place because of economic difficulties were over and that the future now looked bright again. Any couturier or fashion-designer would be stunned by the inventiveness of the local people to make up expensive-looking costumes with the cheapest of materials and make them up in a highly imaginative and inspired manner. Each year a theme is assigned to the Palio. This year it was “The Zoo is here”. Each rione developed its own interpretation of the word “Zoo”. 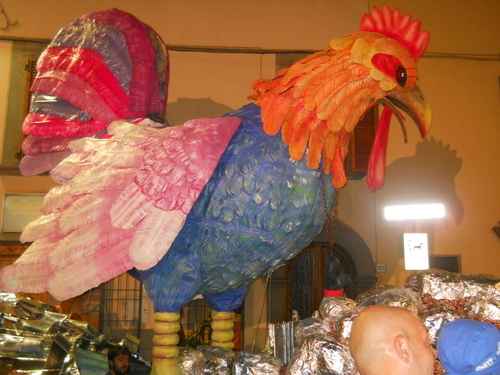 Gallicano’s symbol – its cockerel. For Bufali it was the way that the internet has somehow created a human zoo, a parallel world in which we meet in a virtual reality but must be able to use it in a positive way, not denying what is true reality. A lot more could be read into the ways the different rioni interpreted the zoo theme set to them. Clearly, there was a philosophical interpretation on the vast warm, open-air stage floor but for me that interpretation was transformed into a glory of colour, movement, joy and sheer ecstasy. I could not believe that such artistic force could come from what is essentially a mountain people living in a harsh environment on the fringes of the main centres of Tuscan culture. The Notting hill carnival was nothing compared to it in terms of grace, beauty, and imagination. It was also happily nothing compared to Gallicano’s Palio in terms of the presence of forces of order. I only spotted one policewoman at Gallicano in an event attracting thousands. At the end of this absolutely superb spectacle I could not help being reminded of the following words from Prospero in Shakespeare’s “The Tempest”. They did sound so apt for this occasion. Incidentally, the true meaning of the word Palio derives from Latin pallium which means a cloak and points back to the woollen cloak a competition winner would be awarded. In Siena this cloak becomes transmuted into a standard painted by a famous artist and celebrating the Virgin. For, of course, behind all these competitions there is a celebration of a saint. In the case of Gallicano, it’s Saint Iacopo (Jacob) the town’s patron saint who, from somewhere on high, must be admiring the complex working relationship between faith, community, culture and art which make such events still possible in a country like Italy.